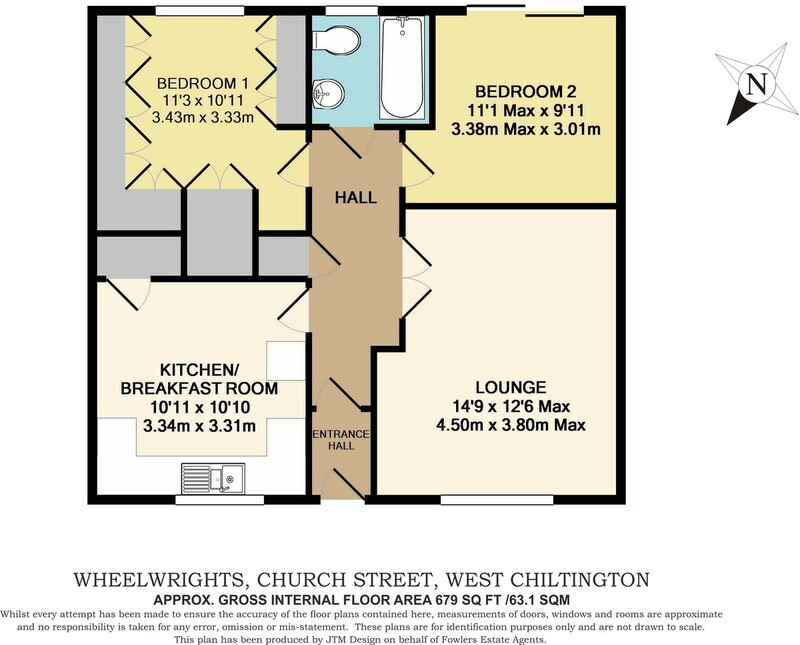 DESCRIPTION A ground floor purpose built apartment occupying part of this select OVER 50'S DEVELOPMENT located in the heart of West Chiltington village close to the Church, local pub and Post Office. Features include: 24 HOUR EMERGENCY CARE SYSTEM, sitting room, pine style kitchen/breakfast room, two double bedrooms, bathroom, direct access onto patio and attractive communal gardens, residents' parking area. The property is offered for sale with NO ONWARD CHAIN. ENTRANCE HALL Wall-mounted electric storage heater, built-in shelved storage cupboard. SITTING ROOM 14' 9" x 12' 6 maximum" (4.5m x 3.81m) Double glazed windows, feature ornamental fireplace with marble inset and hearth, TV point, wall-mounted electric heater. KITCHEN/BREAKFAST ROOM 10' 11" x 10' 10" (3.33m x 3.3m) Extensive range of pine units, inset one and a half bowl single drainer sink unit with mixer tap, tiled working surfaces with further drawers and cupboards under, space and plumbing for washing machine, space for cooker, electric cooker point, extractor over, eye-level cupboards, double glazed windows, built-in larder cupboard, pine panelled ceiling with ceiling fan. MASTER BEDROOM 11' 3" x 10' 11" (3.43m x 3.33m) Range of floor to ceiling partly double depth built-in wardrobe cupboards with built-in bedroom furniture and storage cupboards over, wall-mounted electric heater, double glazed windows overlooking gardens. BEDROOM TWO 11' 1" x 9' 11" (3.38m x 3.02m) Sliding double glazed patio doors leading to terraced area and communal gardens, telephone point. BATHROOM Panelled bath with fitted shower attachment and folding screen, low level flush w.c., pedestal wash hand basin, fully tiled, double glazed window. FRONT Outside storage cupboard, communal residents parking. Small lawned area with flower and shrub borders, outside lighting. REAR GARDENS Delightful communal gardens with immediate outside terraced area, outside water tap, communal gardens are accessed via side walkway and gate adjoining the property. AGENTS NOTE The property currently retains a 69 year lease, the option is available to extend further, we currently await confirmation of costs. (There is a clause in the lease paperwork that allows any owner to extend the lease by a further 99 years at nil cost (except legal fees) - this is very unusual for this to be offered (one time only) - normally a lease extension would costs several thousands of pounds.